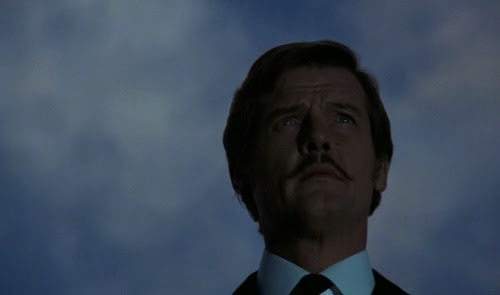 (SPOILERS) Roger Moore playing dual roles? It sounds like an unintentionally amusing prospect for audiences accustomed to the actor’s “Raise an eyebrow” method of acting. 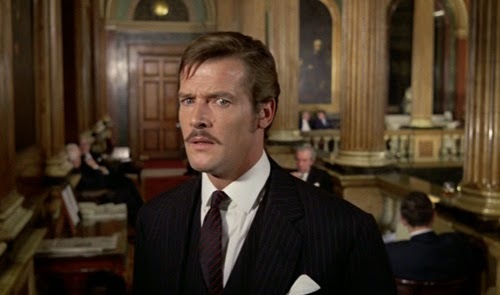 Consequently, this post-Saint pre-Bond role (in which he does offer some notable eyebrow acting) is more of a curiosity for the quality of Sir Rog’s performance than the out-there premise that can’t quite sustain the picture’s running time. 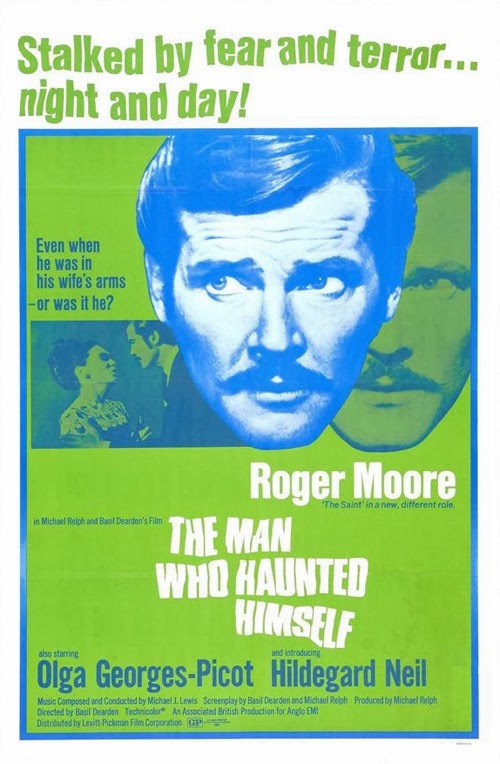 It is telling that the same story was adapted for an episode of Alfred Hitchcock Presents 15 years earlier, since the uncanny idea at its core feels like a much better fit for a trim 50 minute anthology series. 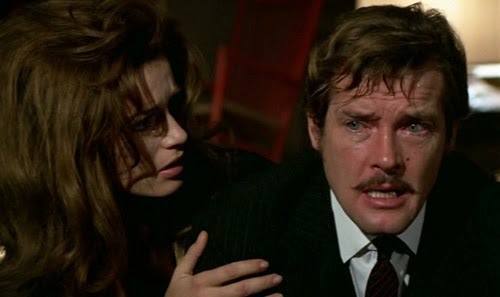 Basil Dearden directs, and co-adapted the screenplay from Anthony Armstrong’s novel The Strange Case of Mr Pelham. Dearden started out with Ealing, helming several Will Hay pictures and a segment of Dead of Night (one might imagine a shortened version of this tale ending up there, or in any of the portmanteau horrors that arrived in the years preceding Man’s release). Notable Dearden films over the previous decade included League of Gentleman and Victim. 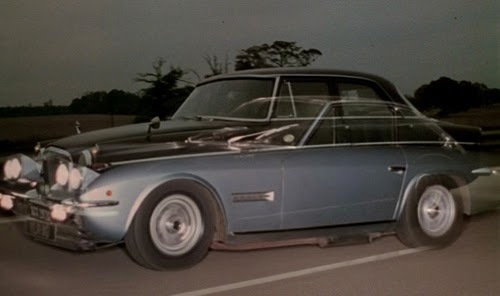 This would be his last feature; he died in a car crash following a day’s shooting on an episode of Moore’s TV series The Persuaders! As Sir Rog tells it, this was spookily on the same stretch of the M4 where Man’s crash was filmed. The clean framing and editing of Man bear more than a passing resemblance to the approach look of Lew Grade’s ITC series (probably not a coincidence, given the common DP). A number of feature directors transitioned to Grade’s relatively glossy series; glossy compared to those of the BBC, certainly. Harold Pelham (Moore), a husband and father with a City job on the board of a marine engineering/technology company, drives to work one morning when a strange force takes hold of him. He unbuckles his seatbelt (not that it was the law to wear one then; this is an indication of how conservative Harold is) and, smiling maniacally, drives faster and faster before crashing his car. Taken to the operating theatre, his heart stops and briefly registers two heartbeats before returning to normal. When Harold has recovered and resumed his old routine, he discovers that friends and acquaintances are giving him conflicting accounts of his behaviour. It appears that he has been in two places at once, and that he is conducting an affair with a woman he has never met before. He objects to a merger/takeover at work but is perplexed to learn that the rival firm has assumed his support. Eventually he seeks the help of Dr Harris (Freddie Jones), a psychiatrist who believes his problem is one of sexual repression. He instructs Harold to unleash the side of his personality he has fought against (“Don’t be a slave to convention”), but Harold is about to discover he already has. Dearden keeps the precise nature of what has befallen Harold hazy until the final 10 minutes. There is always the possibility that, however contradictory events seem, there is a rational explanation. Maybe Harold is experiencing a multiple personality, a less malign riff on Norman Bates, and Dr Harris will cure him in the final reel. Maybe, as his baffled work colleagues ponder, there is a double of Pelham. 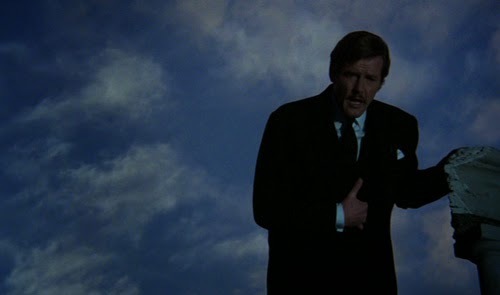 Could it be some extreme case of corporate spying (“Espionage isn’t all James Bond and Her Majesty’s Secret Service” Pelham explains to the board)? 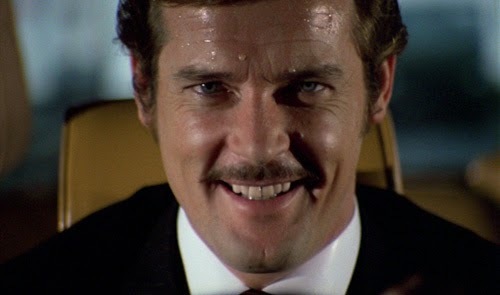 Yet Dearden has laid out the clues from almost the first scene. The strange antic expression assumed by Harold while he is driving, the transposing of his Rover with another a car (a flashy Lamborghini). 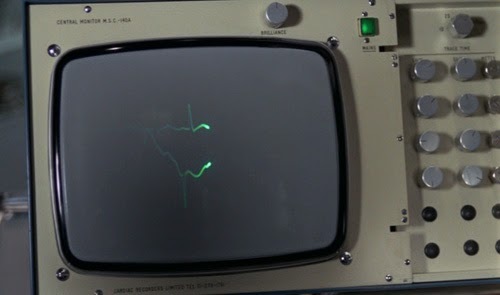 Then there is the double heartbeat; it is evidently not a subjective shot as all the medical personnel note it. 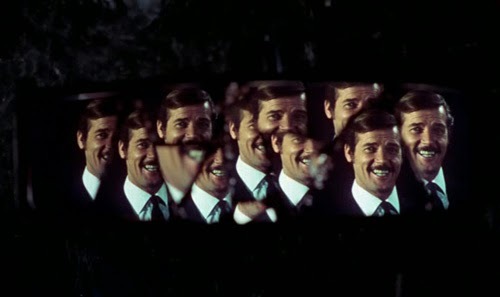 Flashback sequences are employed when Thorley Walters’ Bellamy (“Frank Bellamy has got mental B.O. !”) relates a particularly victorious snooker game at the club, and again when Ashton (John Carson) relates the secret meetings he claims Harold arranged in order to broker the takeover bid. Dr Harris attempts to put us off the scent by drawing attention to the theory behind the illusion of doubles (Pelham’s is only distinguished by his not actually having seen his double). 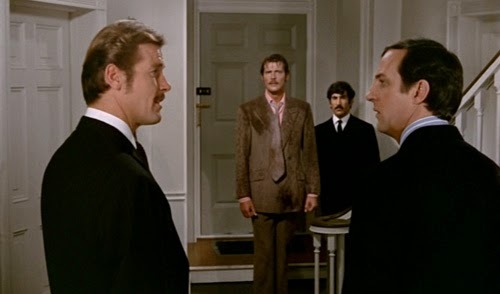 It is only when Harold calls home (having checked into a clinic, while his double appears to take over his home life) that Dearden finally makes an explicit confirmation; his double answers, and dismisses him tersely (“Unless you want trouble, just get off the line”). Pelham: Who on Earth are you? Who are you? The confrontation is at least slightly unexpected in staging, as it takes place in front of witnesses. Thus friends and family reject rigid Harold (I’ll call him that, rather than good Harold), who has begun to dress more colourfully at his shrink’s request, in favour of gregarious Harold (I’ll call him that, rather than bad Harold). The conclusion rigid Harold reaches wouldn’t be out of place in The Prisoner’s The Schizoid Man episode (“It’s a conspiracy. You’re trying to drive me mad”), and it’s interesting that Dearden encouyrages a definably strange and supernatural explanation rather than settling on an ambiguous note (pointedly, even Dr Harris sees the second Harold). How and why gregarious Harold is so clued up on what has happened but rigid Harold isn’t is anyone’s guess. Except that someone needed to be able to offer the audience a vague explanation. He tells rigid Harold that he died on the operating table “and let me out” but “Unfortunately you came to life again. So now there are two of us”. 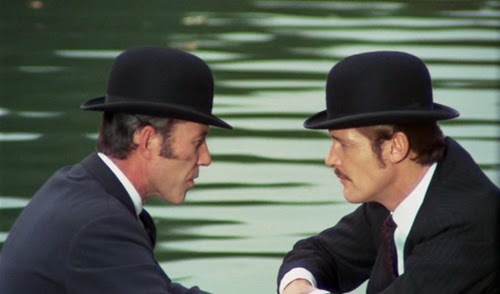 Part of the problem here is that, by stretching and stretching Pelham’s ignorance and avoiding a confrontation for as long as possible, Dearden ends up doing the storytelling a disservice; there can only be so many different (repetitive) encounters and baffled responses before the plot requires some forward momentum. Although Man opts for a supernatural explanation, Dr Harris has provided Harold with a precise explanation of his malady. Gregarious Harold is indulges in “all the pleasures of life” as referenced by Harris; he takes chances romantically and gambles in business and at the roulette wheel. He also enlivens the marital bed. The finale features a chase between the two Harolds, in which rigid Harold’s car crashes off a bridge and into a river. 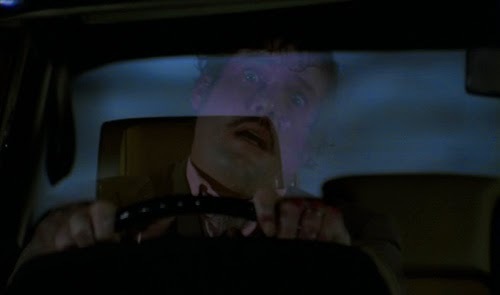 As it does so, rigid Harold fades from the driver’s seat. Looking on as the car sinks beneath the waters, gregarious Harold experiences chest pains then recovers. As he does so, it appears that the hardedge to his face disperses. It seems that the two Harolds have (re)merged, perhaps now as a better person overall (this isn’t far from the plot of Fight Club, and a number of “He was two people all along” twist tales; only through extremes can the protagonist rediscover his core self). Certainly, that was Moore’s take and it makes sense of what we see on screen. 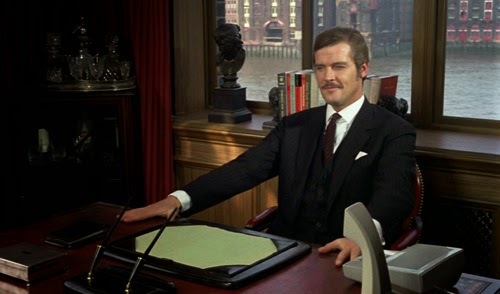 Pelham: I can assure you the only Harold Pelham is the one sitting here. In terms of audience identification gregarious Harold is the bad guy, in that he is messing up rigid Harold’s life. But rigid Harold is actually causing most of the trauma to those he knows as he messes up his doppelganger’s plans. If we follow the line that gregarious Harold has improved the (financial or emotional) wellbeing of those around him, then the moral of the tale might be that a bit of amorality can do the world of good. However, the final scene seems to be suggesting that it’s balance that is important. Dr Harris appears to be in favour of a form of ‘60s liberality, as bottling up one’s desires can cause only harm. The narrative concurs, since this repression has forced a life-changing event on Harold, an intervention by a part of him (released before he “died”, but prevented from existing with full autonomy). Rigid Harold was leading his wife and family into a “dreary and suburban” desert; the kind of man who wears the same tie to work every day. Gregarious Harold goes to the other extreme, including keeping a bit on the side and engaging in highly unethical business practices (it’s amusing to note that his colleagues get on board when he sells them the idea that everything he has done has made them a lot of money; only the chairman says he no longer recognises the man sitting there, and he abides by the values and methods of rigid Harold), but is he doing any more damage than his staid other? 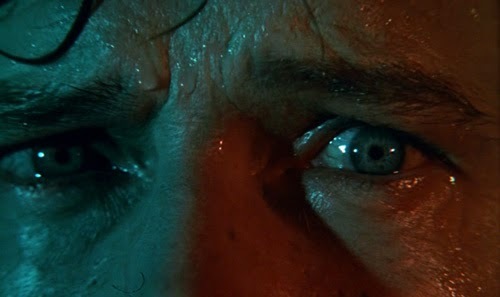 Dearden really goes to town on the hallucinatory visuals during the final chase scene, bathing Rog in red and green lights and dissolves of snooker balls rolling towards the camera (the cinematographer was Tony Spratling). There is also a great uplifting-yet-melancholy central theme (also incorporated diegetically as Pelham’s favourite record) by composer Michael J Lewis, variations on which are used throughout. If Moore delivers a career best, he is ably supported. Anton Rodgers, latterly best known for his sitcom work (Fresh Fields, May to December) is his best pal business partner, while Hildegard Neil deserves better than the reactive wife role. 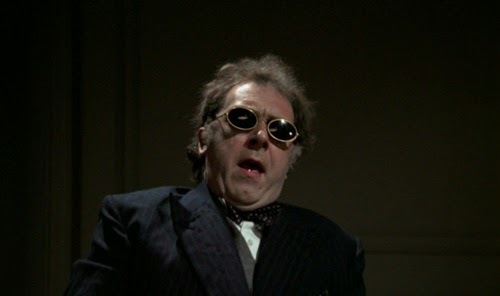 Freddie Jones is insanely over-the-top as Dr Harris, complete with oval sunglasses (worn indoors) and an elusive accent. One of the members of Pelham’s board is played by Edward Chapman, best known as Mr Grimsdale in a number of Norman Wisdom comedies. 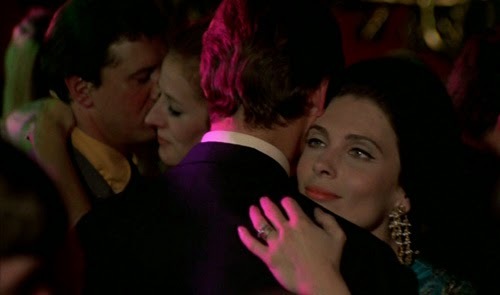 There’s also an appearance from the gorgeous Olga Georges-Picot, as Pelham’s girlfriend Julie. A few years later she’d memorably appear as Countess Alexandrovna in Woody Allen’s Love and Death. There has been a will to reappraise The Man Who Haunted Himself in the past few years Understandably so, as it is something of a curiosity on Moore’s CV. As a result, it might have received a few too many bouquets. By delaying the Harolds’ face-to-face, Dearden attempts to draw out more speculation as to what is going on than he can sustain. He has already primed us to expect something odd, so when we reach the reveal the confrontation is more effective than the undercooked explanation. Nevertheless, he gets extra marks for the ambiguity of the final scene. This is a well-made curiosity and a makes for an appealingly different sighting of the future Bond.